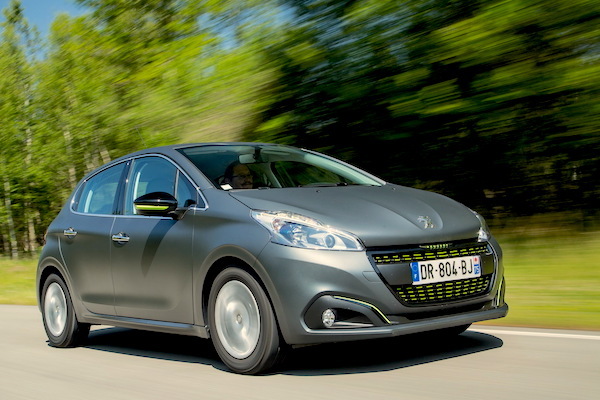 The Peugeot 208 is the best-selling model in New Caledonia in March. Picture largus.fr. New light vehicle sales in New Caledonia, a French Overseas archipelago located north-east of Australia, are down again in March at -10.8% to 705 registrations, pulling the year-to-date volume down 13.4% to 1.951 units. This month only for the third time in the past year, Peugeot is the most popular carmaker on the archipelago thanks to deliveries shooting up 65% year-on-year to 14% share and is now up to #2 YTD. Citroen (+5%) takes the second spot above Dacia (-6%) which remains in the YTD lead for just 3 sales and with Citroen 6 units below. Toyota (-13%), Renault (-17%), Ford (-52%) and Hyundai (-41%) follow but all struggle. Below, Land Rover (+140%), Mitsubishi (+73%), Subaru (+52%) and Volkswagen (+48%) impress. Justifying the brand’s surge this month, the Peugeot 208 (+129%) is the best-selling nameplate in New Caledonia for March and shoots up to #3 YTD in the process. The Dacia Duster (-34%) takes 2nd place and the Ford Ranger (-24%) round up the March podium but remains in the YTD lead (-4%), 5 sales above the Duster (-28%). Below a hard hit Toyota Hilux (-34%) the Citroen Jumpy is up 11-fold on March 2017 to land in 5th place, with the Subaru XV (+150%) and Peugeot 3008 (+157%) also posting spectacular gains in the Top 10. Full March 2018 Top 30 All-brands and Top 30 models below.